Cadillac Cars, Sport Cars and Limousines were Elvis’ lifelong passion Elvis Presley sold the 1971 De Tomaso Pantera Sport Car in 1976 It went through a number of owners. In 1981 the car was purchased for $2 million The Pantera was the idea of an Argentinian racing driver, the fiery Alejandro de Tomaso. He settled in Modena, Italy, in the 1950s, with American wife Isabelle Haskell, also a racing driver, to form their race-car-building concern in 1959. De Tomaso produced a string of sports racers and F2 cars, and then they dipped their toes into production-car waters, using primarily Ford engines. Their first model was the central spine-chassised Vallelunga, then the Giugiaro-designed Mangusta, which the mid-engine Pantera superceded in 1971. Designed by Tom Tjaarda, engineered by Gianpaolo Dallara and powered by Fords 351 Cleveland V8, a relative of the Mustang Boss 302, the Pantera was imported into the United States from 1971 until 1974 and sold at Lincoln dealerships. It was called by one magazine an exciting, but an unfinished product. 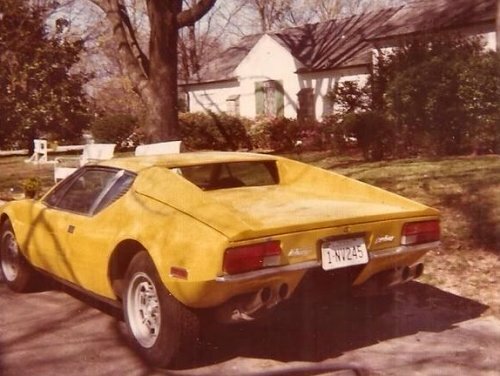 Elvis shot this yellow Pantera with his personal firearm during a temperamental outburst when he lost patience because the car would not start. The car sustained several bullets. One into the tire, one in the driver-side door and the last bullet went through the steering wheel. Elvis bought this Pantera for $2,400 in 1974 for his girlfriend, actress Linda Thompson. Although its mid-engine configuration qualified it an ‘exotic car’ for its potent Ford engine. 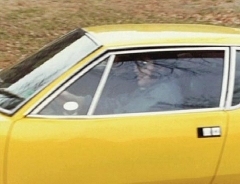 Elvis driving his De Tomaso Pantera. The car Elvis shot! The undaunted, the yellow Pantera, did start up immediately on the second try. It takes more than three bullets to stop a Pantera! When Pantera buyer saw this car in the collection of the owner of Fritts Ford, Riverside, California, it had at least one bullet hole in the door was repaired – only bullet wound in the steering wheel remains.